**If West Hartford Public Schools are delayed or closed due to weather this meeting is canceled. Please refer to our calendar or Channel 3 wfsb.com for closing information. Please park in the Isham parking garage for ticket validation. 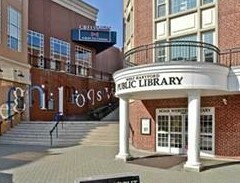 Use the lower entrance, located in the Blue Back Square courtyard (opposite Barnes & Nobles). DO NOT pay for parking at the kiosk, have your license plate number available to enter at the meeting for complimentary parking. West Hartford Connections is a fun and energetic morning leads exchange group that is held the 1st and 3rd Friday of the month. Attendees are given the great networking opportunity to connect with others doing business in the West Hartford area. Each meeting follows an agenda which allows professionals to provide a short commercial about their business and find other businesses to connect with. There are also 2 five minute spotlight opportunities available for members only to discuss their businesses in more detail. Please bring business cards and enjoy a light breakfast and coffee supplied by Goldberg's. Non-members welcome! Please consider bringing 2 non-perishable food items to the meeting which will be donated to the West Hartford Food Pantry.